You’re interested in checking out a new restaurant in your neighborhood but you’d like to know what other people think of it first. You can always visit Yelp or OpenTable to get a review but wouldn’t it be better to get an opinion from a friend? Or maybe you’re visiting Paris for the first time and are looking for somewhere to stay. Again, there are plenty of guide books to choose from but a more personal recommendation could make all the difference. If we think about where we might be able to find personal recommendations on where to eat, where to stay, and a thousand other things we might want to do, there is one obvious answer: Facebook. That’s the inspiration behind graph search, a new search engine tool for Facebook that was unveiled yesterday by Facebook CEO Mark Zuckerberg. Most of us first heard the term ‘social graph’ just over a year ago when Facebook started rolling out Timeline. Think of it as the graphical depiction of the personal relationships between various Facebook users. If you have 300 friends and each of those friends has 300 friends, that’s an enormous network of people who may have similar interests to you, including the arts, books, food, travel, or any number of professional or leisure activities. Graph search is the ability to tap into that social graph and find information that’s relevant to you. Some more examples: Say you’re a single guy arriving in New York City for a new job and want to contact some other singles. Just type ‘single Friends living in New York City’ into the search bar and you’ll have a list of friends to contact. Or you could type ‘photos my Friends took in New York City’ and you’ll have a gallery of places to visit. Where information isn’t available within your Facebook graph, it will be supplemented by Microsoft’s Bing web search tool, but the idea is to clearly make graph search Facebook-centric. At the unveiling of graph search, Facebook executives went to great lengths to stress that the tool was ‘privacy aware’, which means that users’ data will only be found if they want it to be found. However, there is no built-in ability to make all your information unsearchable the way there is for third-party search engines. They also stressed that graph search will only look at Likes, check-ins, and pictures and not status updates, although it’s easy to see graph search widening its net once it becomes an accepted Facebook feature. Of course, any tool that taps into more specific Facebook data is also going to be of interest to advertisers, so expect some of those Google-style ‘sponsored results’ as graph search matures. However, Facebook gave some assurances that the graph search tool would not be available to brand pages, so, for example, Starbucks would not be able to mine the data of the 33 million plus Facebook users that have Liked the Starbucks page. Graph search will be available in beta form to a few thousand users before it rolls out to the full Facebook membership later this year. 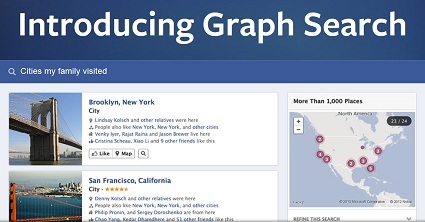 Facebook users eager to sample the tool as soon as possible can join a graph search wait list.